Pinched nerves sometimes heal on their own, but untreated they can lead to disability and permanent nerve damage. A pinched nerve is a nerve under abnormal pressure—a compressed nerve. The pressure can come from adjacent bones or soft tissues such as tendons, ligaments, muscles, or cartilage. When that happens, the brain sends a signal that causes pain, weakness, or a numb feeling. But what are the most common pinched nerve locations? Read on to find out. Pinched nerves can happen anywhere in the body, but two of the most common pinched nerve locations are the lower back (lumbar region, L4 and L5) and the neck (cervical region, C6 and C7). Why those two locations? For the lower back, it’s because that part of the spine supports much of the body’s weight, which compresses everything. 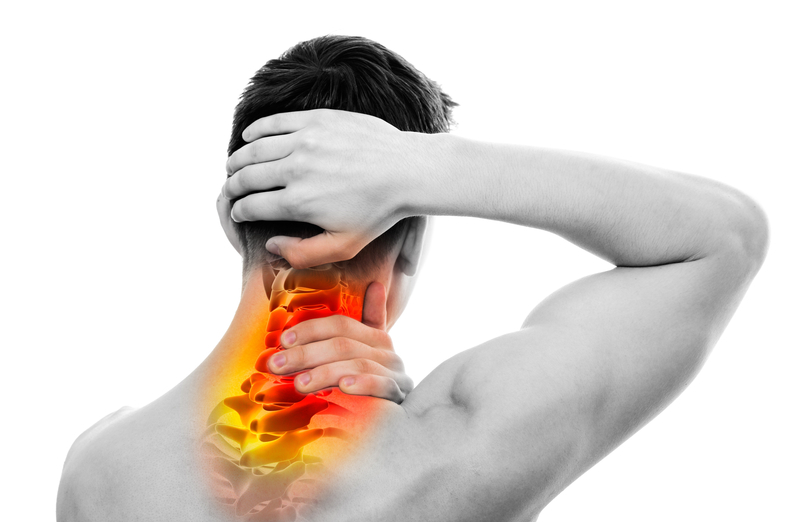 The neck is vulnerable because the head, which weighs 10-11 pounds, is constantly moving and putting pressure on nerves confined to a relatively small place. In addition, normal wear and tear in that part of the spine comes with aging. Who is at Higher Risk of Pinched Nerves? Among those who are at an increased risk are people in their 50s, athletes, serious exercisers, those who perform heavy labor, and workers who use vibrating machinery. In rare cases—three percent of the time—surgery is last-resort treatment for pinched nerves. Of the more than 50 back surgery procedures, the three most common are microdiscectomy, laminectomy, and laminotomy. How are Pinched Nerves Diagnosed? The diagnosis protocol for most orthopaedic problems, including pinched nerves, is 1) medical/family history, 2) physical examination and tests for reflexes, muscle strength, and possible loss of sensation), and 3) imaging tests such as X-rays, CT scans (to detect bone spurs), MRI scans (to assess soft tissue involvement, such as a bulging disc), or electromyography (to measure electrical impulses of muscles at rest and while contracting). One or two—not all—of these tests might be ordered. Most cases are treated conservatively. Medications such as aspirin, ibuprofen, naproxen can relieve pain. Heat and/or ice provide temporary pain relief, but do not address the underlying causes. Physical therapy helps relieve pain, strengthen muscles, and improve range of motion. Traction can lessen the pressure being placed on nerves, and a soft cervical collar allows muscles in the neck to rest. Oral and injectable steroids near affected areas reduce inflammation. Patients with severe pain may be prescribed narcotics, but this is happening less often and for a specific, limited amount of time. In rare cases—three percent of the time—surgery is last-resort treatment for pinched nerves. Of the more than 50 back surgery procedures, the three most common are microdiscectomy, laminectomy, and laminotomy. A microdiscectomy trims the bone and ligament that is compressing a nerve. A laminectomy is complete removal of the lamina (the roof part of the ring that covers the spinal cord). A laminotomy is partial removal of the lamina. Some people recover from a pinched nerve without treatment. With others, at-home treatment usually works. Medical treatment, according to the National Institute of Neurological Disorders and Stroke, allows most people completely recover. In some cases, the damage is irreversible. Don’t take a chance. If you think you have a pinched nerve that is causing debilitating or recurring symptoms, get treatment. aging, arthritis, back pain, back surgery, bone, brain, bulging disc, cartilage, exercise, herniated disc, inflammation, low back pain, muscle, neck pain, nerve pain, obesity, pain, pain management, pain relief, pinched nerve, pins and needles, posture, reduce inflammation, relieve pain, sciatic nerve, sciatic nerve pain, sciatica, sciatica pain, severe pain, strength, stroke, tennis elbow, tumor. I thought you might be interested in this article on https://universityhealthnews.com: Pinched Nerve Locations: Where Are They Most Common and What Can You Do About Them?